MailerLite 2019 review - why 4.8 stars? MailerLite sets itself apart from other email marketing services with a unique pricing plan and effective customer service. It bolsters small-business growth by supporting 40+ apps to help entrepreneurs get things done quickly, and provides a quick way to build landing pages. MailerLite’s campaign editor features unique tools to help users create unique designs that will connect with customers and boost engagement. MailerLite has 21 templates in total, which is very small compared with what other EMS providers offer. Some offerings are common like the “Newsletter” and “Sale Picks” layouts. Others are a little bit more unique, such as the “Gallery” layout which primarily consists of photo blocks that would be great for photographers showcasing their work. With very few templates on offer, choosing the best one for you should be relatively fast. Still, the templates could definitely be better organized, and I wish they had more intuitive names. “Inspiration,” “Introduce,” and “Publication,” for example, are vague — I wouldn’t immediately know what to do with them. MailerLite’s template designs are professional and have a modern feel to them, and the content elements are placed intuitively depending on the goal of the layout. For example, the template called “Featured Deals” has image and price blocks set up in columns. The “Product Announcement” template has large image blocks so you can highlight products, with text blocks that make it easy to describe their details. After you’ve captured a customer’s attention, he or she can click the product listing at the bottom to buy. MailerLite allows you to customize templates in a number of ways. You can move, add, and delete content blocks, and tweak various style elements like text. No matter the template you use, it’s easy to upload your logo and change the colors to match your brand. A personalized message is recommended to connect with the customer for potentially better results. Currently, MailerLite can integrate with 40+ compatible apps. MailerLite’s A/B testing functionality gives you a choice to either copy your first version to change a couple of variables, or to design two emails from scratch. For the most effective tests, I recommend changing as few elements of the campaign as possible. MailerLite makes it easy to choose which elements you’ll test and automatically send the winning design to most of your email list when the test is over. 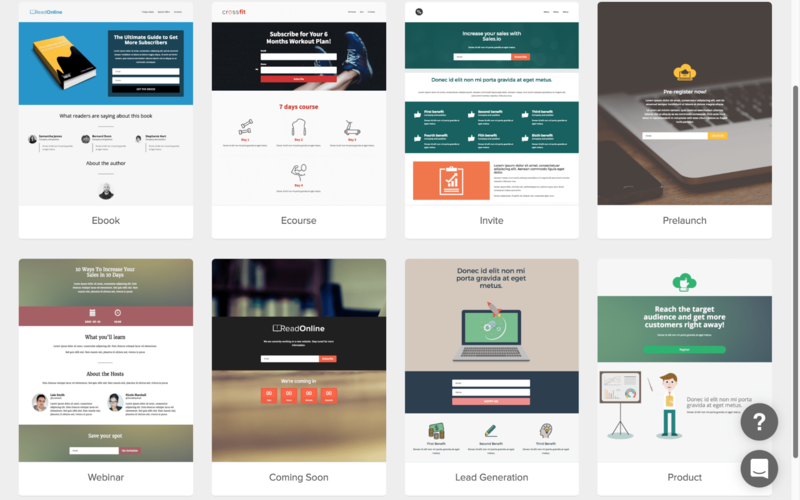 The landing page builder is one of the features that makes MailerLite stand out. When customers click on a link in your email, you can give them information on your landing page about how to sign up for your newsletter, for example. The pop-up and embedded form editors have a similar layout. Because of the nature of the forms, the process of designing these is faster. MailerLite’s drag-and-drop editor is clean and easy to use. Unlike many other EMS providers, MailerLite’s editing interface is uncluttered and intuitive, and I particularly like how there’s a section to the right side of the screen with clearly labeled building blocks and a clean space where you can edit your draft. I used a premade “Newsletter” template, which was very easy to customize. All I had to do was click on various content elements, drag them to where I wanted, and the tweak them based on various design considerations like style and color. The editing options appeared on the right side of the screen until I was done designing the element. Once I saved it, I could add another content block. 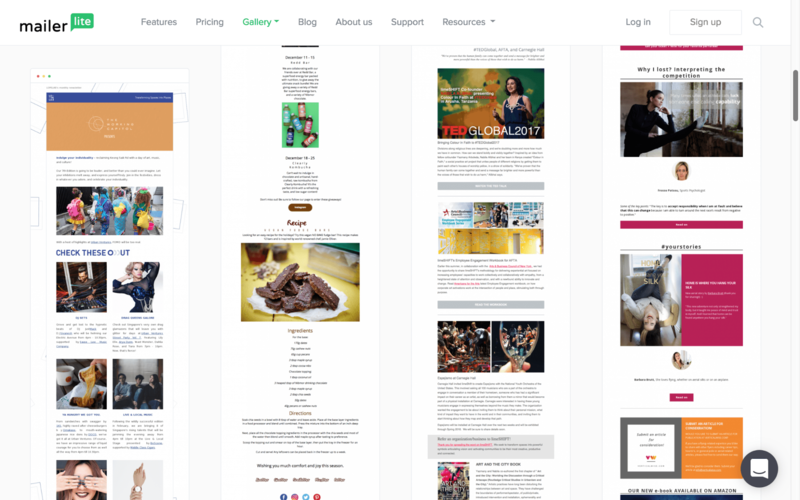 When designing an email campaign, I like to be able to try different design styles and positions for various elements before committing to the design. That’s why I like MailerLite’s “track changes” feature. It lets me backtrack and undo changes quickly when I want to try something new. If I didn’t like the new change, I could easily return to my previous design. For my Newsletter campaign, this feature was a time-saver because I was able to keep track of the pictures I tested out before committing. The overall process of creating my campaign was easy for the most part, but occasionally it took quite a while to upload pictures for my email. One time, my browser even froze. But other than that, the process was smooth. I always preview my design on mobile when it’s offered. The mobile preview feature on MailerLite is unique in that it doesn’t just resize your campaign; it also displays the email on a mock mobile or tablet screen with a working scrollbar. One downside to MailerLite is that there’s no way to do a spam or design test before sending an email campaign. There are also no advanced reporting features to tell you how your email performed. MailerLite customer service is miles above all of the other EMS companies I’ve reviewed for one simple reason: 24/7 chat support. Great support is not just promised — it’s actually delivered. I was having trouble finding the template gallery to start designing my campaign. I simply typed my question in the box and received an answer with a link to the gallery in under five minutes, which is within their expected response time. I liked that I could see the name and picture of the representative who was helping me, and the green light made it clear that she was active. Ironically, I found the answer to my question faster by searching in the Help Center, but her response was still effective and timely. The Help Center also includes 20+ video tutorials on topics like upgrading your account, creating segments, and creating an email campaign. There’s also a guide to getting started with the service, and a wide range of FAQ-style questions and answers. Maybe you’re more of an email person, though. If you have time to send one and wait, the “Contact Us” feature sends you to the Help Center search field. You can ask a question there, and if you can’t find an answer you have the option to submit an email ticket. If you prefer the phone, however, you’re out of luck. I couldn’t find a number to call. Pricing at MailerLite is unlike many other EMS providers. Even the free plan gives you access to all features, and what you pay doesn’t depend on how many emails you send per month, but rather on how many contacts you have. That means you’ll always have access to every feature MailerLite offers, regardless of whether you send one or 1,000 emails per month. The first tier plan is free for up to 1,000 subscribers. Paid plans start when you hit 1,001. Regular plans stop when you hit 50,000 subscribers. High-volume plans start at 50,001 and go up to two million subscribers. High-volume plans have email sending limits. This pricing model is more effective for small-business owners. As your customer base grows, you’ll be financially able to pay for a plan. Access to all of MailerLite’s features helps people create email campaigns that will spark that growth. It’s a win-win situation for both MailerLite and their customers and makes more sense to me than restricting certain features pending payment. MailerLite is one of my favorite email marketing services available. In my opinion, setting the pricing model around a company’s number of contacts supports small-business growth. The campaign editor is intuitive for everyone, no matter how comfortable you are with computers. It’s a great service for startups, freelancers, artists, bloggers, and any small to mid-sized business. Larger businesses that need a lot of data and analytics should look elsewhere. MailerLite’s template gallery is the only area where the platform is severely lacking. But the 24/7 live chat support truly sets MailerLite apart from competitors. A solution to your problem is rarely more than five minutes away.